When I somewhat nervously showed this to Dorothy for the first time, I was gratified to find that she was delighted to see the diagrams and be able to follow the moves so easily. I have attempted here to work out the moves of the game in it's early stages - by no means all of the moves are explicitly stated in the text but it is possible to reconstruct the play by avoiding the obvious blunders and using the inferences in the later descriptions of the positions to work back and confirm what must have been played. It should be noted immediately that because of the reduced number of men this is a highly artificial position and that Gabriel has not only the advantage of two pawns but also the first move. Those two pawns protect his King to a certain degree, while the Black King is quite exposed. That allows the possibility of chasing the Black King around and possibly picking up more material on the way. Given that Lymond also has to avoid taking the pawns or exchanging any of his pieces, he is at a great disadvantage and really should lose in short order. He must take chances and rely on Gabriel being overconfident and blinded by short-term threats and chances for gratuitus cruelty. Any apparent criticism of the play should be taken with with this very much in mind, but I have attempted to analyse the moves in a modern manner to show both the true nature of the play and the knife-edge balance between the two sides. We follow the modern standard algebraic notation of moves where the files (columns) are given the letters a-h and the ranks (rows) numbered 1-8. The bottom left corner is therefore a1 and the top right h8. The + symbol means check, and the # symbol means checkmate. The starting position is defined in the text sufficiently that we can establish it as being as shown in the first diagram, and play proceeds as follows. A good move but also forced since he needs to make space for his king as otherwise ...Qh4 is mate! a mistake in that there are better moves, but this was probably intended to frighten the Lymond camp and induce panic. "Gabriel's Rook moved up the board, harmlessly..."
seems the only move that agrees with this description....a3 is covered by the black bishop, a4 would attack the black queen, a5 would mean that black's next move would simply put the night en-pris, a6 would be threatening rather than harmless while a7 would pin the black knight to the king making any move by it impossible. It is a rather weak move, although black was threatening Bg7. "and Jerott himself moved down"
The only move that allows it to move to c4, which we know it does on the next move. The objectively best move, Qh1, is impossible in the circumstances as Gabriel would happily swap his Queen to kill Marthe, but this is a mistake which Gabriel fails to take advantage of. Qd4, covering the d5 square was better. Gabriel cannot resist offering Kuzum as a sacrifice but he should have played Qd5 check, when the Black Knight (Jerott) would be lost after ...Kf6 6.Ra6+ Kf5 7.d4. …Ng5 was better. This should again lose to Qd4 forking King and Knight, but it seems Gabriel is thinking on different lines. "There was a move by Gabriel's Queen which forced Lymond to a white square, but otherwise didn't do any harm"
6.Qb7+ would be better and is possible but if this was the move played there would be many possibilities for Gabriel to win easily over the next few moves the way the game seems to go. 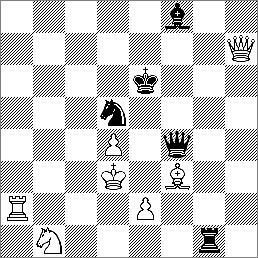 For instance if 6...Ke6 7.Bg2 threatens the fork on d5 and if 7...Qg5 8.Be4 Qf4 now Bd5 wins easily. seems the only possibility since going to the g file would prevent the black rook moving down it later and would mean that Gabriel's queen move later would be check, while going to e8 would allow a mate later. "Then there followed some play between Marthe and Gabriel's Bishop..."
this next section is the most difficult to infer accurately but this seems the most likely course. "...which brought Archie also into the game..."
"...until Gabriel sent his Queen over and next to Archie..."
In fact it is now possible for Lymond to checkmate in 6 moves, but it involves taking the Queens pawn (Kuzum). 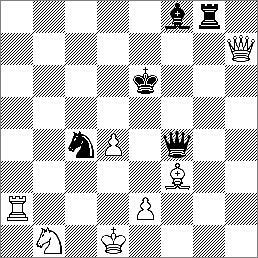 10...Qxd4+ 11.Qd3 Ne3+ 12.Kd2 (12.Ke1 Rg1+ 13.Kf2 Ng4#) 12...Bb4+ 13.Nc3 Bxc3+ 14.Kc1 Rg1+ 15.Qd1 Rxd1. best now would be ..Rc1+ but that play would involve swapping pieces and thus losing Jerott. "...then removed Jerott, neatly exposing Gabriel to attack by his Queen"
this must be the square it goes to because we know that Gabriel has a choice of two squares for his move and any other move leaves three possible squares. the other square (c2) would protect the Knight which is about to be taken. This is a very interesting position, (always assuming that our detective work has led us on the right path) because it is so finely balanced with opportunities for both sides. 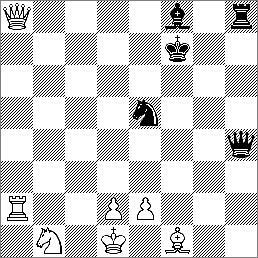 Both Kings are exposed and currently it is White's that is under attack - however if that attack is neglected for only a moment it will be Black's that will be more in danger. a crucial point in the plot as the first casualty of the game occurs, but in fact this move is a mistake. There was a chance for Lymond to do better with 13...Nb4+ 14.Kc4 Nxa2, winning the more dangerous Rook instead of the undeveloped Knight and also taking Jerott out of the firing line. After the move played, Gabriel could have struck by taking Jerott with the Bishop - surprising that he didn't but perhaps he was so shocked by losing his own knight - not only would that have been a real-life blow to Lymond but in fact the Bishop cannot be retaken because after 13...Rxb1 14.Bxd5+ Kxd5 15.Qd7+ Bd6 16.Ra5+ Rb5 17.Rxb5 is mate. From here on we lose track of the game; the descriptions becoming more character-focused rather than relating directly to the detail of the play. We know that in general Gabriel advances the pawns towards the 8th rank and promotion. Kuzum becomes a Bishop while Khaireddin becomes a Knight. Beyond that we have only general descriptions as the text concentrates on Jerott's impressions and little scenes such as Lymond's close encounter with Khaireddin where he promises that the child can chose what they play next and Khaireddin smiles genuinely. As for the final position, that remains a mystery. I have spent many hours trying to construct a position that conforms to the requirements of the text, but so far without success. 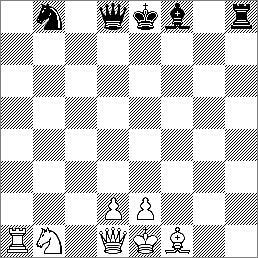 It has the scenario of a constructed chess problem and perhaps requires a problemist to say whether it is possible or not. The principle of a double option of mate is certainly possible (and is a brilliant conception) but whether it can be done with the limited material, and whether that can also include the threatened mate to black as well is very hard to say. Chess problems are hard enough to solve the "right way round" - trying to reconstruct them from the closing moves is a task requiring inspiration and a lot of time. I had in fact asked Dorothy about it and she said that the final position was on the back of an envelope in the boxes of Lymond material in her attic and that she wouldn't be able to look for it until she had completed Gemini. Apparently she had consulted with a strong Edinburgh player at the time and he had helped construct the position. She couldn't recall his name which was a pity as it's quite likely that I had met the person since I was actively playing in the Edinburgh leagues around this time. Sadly that envelope has never come to light, though it's possible that it may still be found in the archives in the National Library, but I did continue on and off to work on the position, sometimes with the help of other readers.